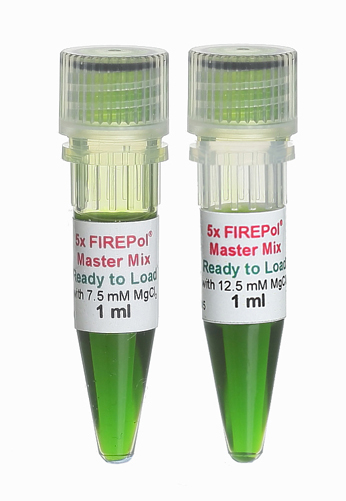 We recommend using 5x FIREPol® Master Mix Ready to Load in any PCR application that will be visualized by agarose gel electrophoresis and ethidium bromide staining. 5x FIREPol® Master Mix Ready to Load is not recommended for use in post-PCR applications where spectro-photometric measurements (absorbance or fluorescence) are necessary because yellow and blue dyes can interfere with these applications. 04-12-00125 1 ml 12.5 mM MgCl2 PDF PDF PDF 17.5 EUR Login to buy! Like all our products, the 5x FIREPol® Master Mix Ready to Load is stable at ambient temperature for up to one month. This makes handling and set-up even more convenient, since no ice has to be used. Shipping and temporary storage for up to 1 month at room temperature or storage for up to 6 months at 2-8ºC has no detrimental effects on the quality of FIREPol® 5x Master Mix Ready to Load.